This image was inspired by the scene in Luke 4 when Jesus returns to the synagogue in Nazareth and opens the scroll to read. The writings on the blackboard behind Jesus are the opening words of the text from Isaiah which Jesus proclaimed that day. They are at the very heart of the Christian teacher’s vocation. Jesus is depicted holding symbols of the means by which teachers have taught the Word over the centuries since His time on earth. 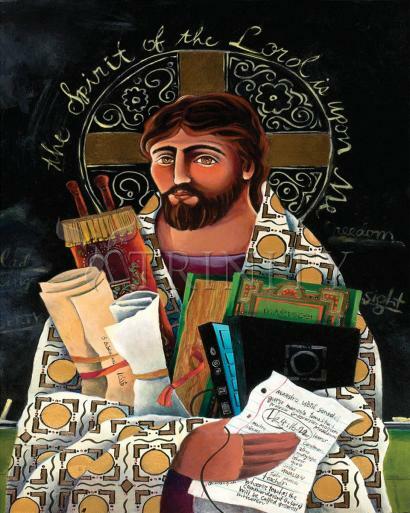 The scrolls in His right arm show the word “teacher” written in Aramaic and Greek, the two languages He would have spoken. Behind them is a Torah, with the Hebrew word for teacher, or rabbi. In His left arm are a medieval manuscript with “magister”, the Irish word for teacher, and a laptop computer, glowing with the blue light of heaven. On the sheet of loose-leaf paper, the word “teacher” is written in many different languages. Jesus is dressed in white and gold, the symbolic colors of the Transfiguration. The pattern on His robe and the lid of the computer consists of squares, the symbol of earth and humanity, and circles, the symbolic shape of the Divine. The central figure of the Hebrew law is Moses. He is to be seen within Hebrew tradition as the instrument of God in several roles, as deliverer, as leader, as prophet and as law giver. Yet, it is as teacher that he is revered and named, Moshe rabbenu, "Moses our teacher". The Great King Solomon asked for wisdom from God when he was given the responsibility and charge of the people of Israel. Here we see that wisdom means “a listening heart"-knowledge warmed by sympathy and understanding. In the New Testament, Divine Wisdom is the Incarnate Christ whom St. Paul calls: "the wisdom of God" (1 Corinthians 1:24) "in whom are all the treasures of wisdom and knowledge hidden." (Colossians 2:3). One of the gifts of the Holy Spirit is that of wisdom, (1 Corinthians 12:8). Closely connected with the role of teacher is that of spiritual father. Christ was recognized as a teacher or "Rabbi" (John 3:2) and spiritual teachers were part of the life of the apostolic church, (Acts 13:1). Our Lord has a warning to those who would seek their own glory through the title "teacher" and "father" in Matthew 23:9, 10. Jesus is here condemning hypocrisy rather than giving a general prohibition against the terms. Indeed, the Apostle Paul refers to Timothy as "a true son in the faith". The disciple of a Rabbi was known as his son which of course supports St. Paul's title of "father" in I Corinthians 4:15. From an early date, the title "pater" was applied to bishops of the Church as witnesses to the Christian Tradition. The title was applied to those whose authority and defense of doctrinal matters had special significance like St. Basil, St. Gregory of Nazianzen and St. Cyril of Alexandria. The need for a spiritual father therefore for Orthodox Christians has a rich ancestry. The spiritual father is there to lead his son or daughter into a deeper relationship with Christ. He is there to be a friend and confessor, to advise and to encourage, to heal the soul and to take upon himself the important task of prayer for his spiritual child ( Proverbs 15:29) so that they may grow strong in faith (Hebrews 5:12). The spiritual father is not the model to be copied because of his own imperfections, he points to Christ. We should always be aware of the influence of a good spiritual father or teacher. For although in the ways of the world the teacher has little power he wields tremendous influence. Charles Adams, the 19th century educationalist, said of school teachers: - "they affect eternity for they never know where their influence ends." How much more should those who have, through the grace of God, the responsibility of teaching the faith affect eternity? (1 Corinthians 2:13). These things we also speak, not in words which man's wisdom teaches but which the Holy Spirit teaches, comparing spiritual with spiritual." A missionary Orthodox priest serving in a remote part of India had a cassock that was torn and old with patches because it had been repaired so many times. Knowing that he could not afford to send away for one he decided to ask a local tailor to make him a new cassock with a roll of material that had been given to him by a parishioner. The Indian tailor was sent for and agreed to make the cassock but admitted that he had never made such a vestment and that he would require a pattern. "I know what I will do" said the priest," I will let you have my old cassock if you can make it before Sunday. "The Indian tailor thought that this was an excellent idea. Picking up the old cassock and the roll of material he left. Four days later he arrived at the priest's house with a large smile and a package under his arm." I have made your cassock." The Indian tailor carefully unfolded the cassock for the priest to examine. The priest's delight turned to dismay when he saw what was before him. The new cassock had patches on the elbows, a tear by the pocket, buttons missing and darns on the cuffs, just like the old one. "What have you done?" shouted the priest. "You've ruined my holy garment! What possessed you to do this?" "But sir," protested the tailor," I carefully copied the pattern of the cassock you gave to me." May those who teach be taught of Christ and may those who learn be faithful disciples. And with all our power know Him who is the good God and not a harsh judge. All-lovely, All-just One. To whom be glory both now and for ever. Amen.